Panasonic launched company latest android phone Panasonic P81 In India with rich features. This was in news from last few days and now its officially launched by company in India. Panasonic P81 comes with 5.5 inch HD IPS touch screen display with resolution of 1280 x 720 pixels. Panasonic P81 has powered 1.7 GHz Octa Core MediaTek MT6582 processor along with 1 GB of RAM. Phone support dual SIM with dual standby and runs on Android 4.2 Jelly Bean.Phone has dual camera including 13 megapixels rear camera with LED flash and 1080 pixels video recording. Phone also has 2 megapixels front facing camera for video chatting apps. Panasonic P81 has 8 GB internal storage memory and allow to expand it up to 32 GB via support of microSD card. Phone has packs with 2500 mAh battery and it support 3G network along with common connectivity options. 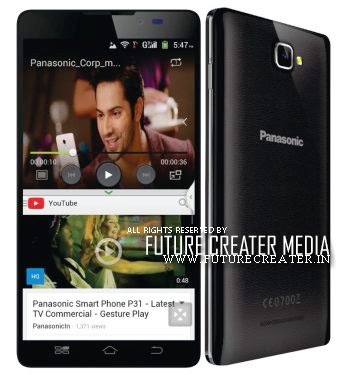 Panasonic P81 has priced at Rs. 18,990 in India and its comes with freebies worth Rs. 9,900 including 6 months Evernote Premium, Hungama content download for a month, India Today Content and etc. It comes with free flip cover and screen guards worth Rs. 2,000. It would be goes on sales in coming days in India.